I love comfort food. There is something so great about a home cooked meal that can completely turn my mood around or make me feel better after I have been sick. Everyone has their favorite comfort food. My two boys prefer macaroni and cheese, while my husband loves pinto beans and cornbread. I love a number of different comfort foods, but my favorite combination is grilled cheese and tomato soup. There is something so delicious about a great bowl of tomato soup and a perfectly cooked grilled cheese sandwich. Canned soup just doesn't do it for me, for tasty tomato soup I must have homemade. 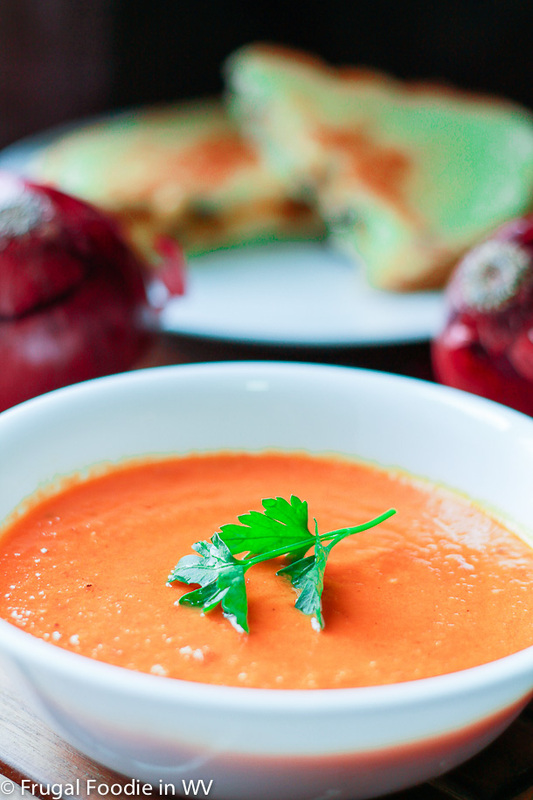 Fresh tomatoes made into a simple tomato soup are easy and perfect. The taste of the tomatoes shines through and just makes me feel great. Last week I tried a new recipe for Tomato Soup from the February issue of All You magazine. This recipe has 9 ingredients. It takes 60 minutes of total time, 30 minutes of which is active. I did make a number of changes to this recipe. First I just made the soup and not the cheddar croutons. Second I pureed the some while it was still warm. Just make sure that the lid is firmly attached and place a rag over the top to ensure that you do not get burned. I did allow the soup to cook for an additional 10 minutes after it was pureed to ensure it was the proper thickness. If you want to make the soup a cream of tomato soup you can add half and half or heavy cream instead of the water. You could also add the half and half or heavy cream at the end of the recipe before serving and allow it to cook for an additional five minutes. I like that this soup is simple and lets the flavor of the tomatoes shine through. Make sure to adequately salt the soup, it will need it. Overall, a great recipe that worked well as a side for grilled cheese sandwiches and I would definitely make again. For the recipe go to Tomato Soup. I hope your feeling better. I love tomato soup and grilled cheese. So does my husband. Tomato soup is my favorite. I usually pair it with grilled cheese and it's one of our family favorite dinners. Tomato soup and grilled cheese it the best! It's snowing and windy today.. This will be perfect for dinner tonight! I have loved tomato soup since I can remember. My mom always said my sister would ask for fish sticks and all I wanted was a bowl of tomato soup! I was the same way growing up, I have always loved it! This sounds so refreshing after a weekend full of heavy food overload! It definitely is light, which is nice! This is my favorite soup, hands down. A lovely recipe. Going over to check out your blog now! Awesome! First off the photo is lovely! I'm not a cook at all but have been learning the past year or so and am going to be making lentil soup tomorrow, (Try and warm myself up seeing as we're still getting snow), but my partner only like tomato and now you've given me a recipe. Thanks for visiting my blog. Have also followed. Thanks for the sweet comments :) I love lentil soup, I bet it will be yummy! my man would love this! thanks for sharing! It really is light and yummy! I simply love tomato soup and prepare it regularly at home in winters! surely homemade is better that canned soups! I love tomato soup also, it is a perfect comfort food!